Ozioma C. Okonkwo, PhD, is an Assistant Professor of Medicine at the University of Wisconsin School of Medicine and Public Health. He specializes in the neuropsychological evaluation of geriatric cognitive disorders, especially those due to suspected Alzheimer's disease. Dr. Okonkwo's research focuses on clarifying how alterations in the brain and other biomolecules (such as cerebrospinal fluid β-amyloid) place some cognitively-normal individuals on a pernicious trajectory that culminates in probable Alzheimer's disease. 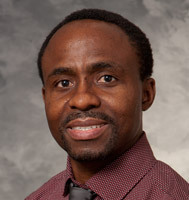 In this context, Dr. Okonkwo is also interested in discovering new knowledge concerning the modulation of the link between brain changes and cognitive decline by both modifiable (e.g., cognitively stimulating activities, physical exercise) and non-modifiable (e.g., genetic vulnerability) factors.